So my friends and I went to see The Dan Band at the Avalon in Hollywood and a few tables down from us was David and friends. He looked... tired, much older and heavier. Funny because this is not the first time I've seen him in person... before he hooked up with Heather Locklear, before the sitcoms... at the start of his career. At a UCLA cafeteria at Comedy Night back in 1988 - over 20 years ago. 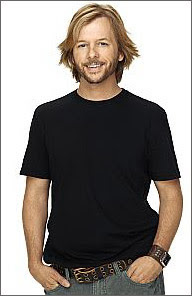 I remember the first words out of his mouth: "Hi, I'm David Spade and I'm 13 years old." He was hilarious... and I miss that innocence and less scarstic comic. Hope one day he makes a comeback.